Bioterrorism is the use of a biological weapon against a civilian or military population by a government, organization, or individual. As with any form of terrorism, its purposes include the undermining of morale, creating chaos, or achieving political goals. Biological weapons use microorganisms and toxins to produce disease and death in humans, livestock, and crops. Bioterrorism is viewed as a serious threat to national security. For example, disaster scenarios created by United States government agencies predict that the release of a few hundred pounds of the spores of Bacillus anthracis (the bacterium that cause the disease called anthrax) upwind of Washington, D.C., could sicken or kill hundreds of thousands to millions of people within twenty-four hours. Bioterrorism can also be used as a weapon to damage or destroy the economy of the target nation. A report from the Centers for Disease Control and Prevention estimates the costs of dealing with a large-scale anthrax incident is at least $26 billion per 100,000 people. Only a few such incidents could cripple the economy of any nation. Indeed, the few anthrax incidents in the last few months of 2001 cost the United States government hundreds of millions of dollars in treatment, investigation, and other response measures. Biological, chemical, and nuclear weapons can all be used to achieve similar destructive goals (i.e., massive loss of life). In comparison, biological weapons are inexpensive to make, relative to chemical and nuclear weapons. A sophisticated biological production facility can be set up in a warehouse, or even in a building as small as a house. Biological weapons are relatively easy to transport and resist detection by standard security systems. In general, chemical weapons act immediately, causing illness in minutes. For example, the release of sarin gas in the Tokyo subway in 1995 by the religious sect Aum Shinrikyo almost immediately killed 12 and hospitalized 5,000 people. In contrast, the illness and death from biological weapons can occur more slowly, with evidence of exposure and illness appearing over time. Thus, a bioterrorist attack may at first be indistinguishable from a natural outbreak of an infectious disease. By the time the deliberate nature of the attack is realized, the health care system may be unable to cope with the large number of victims. 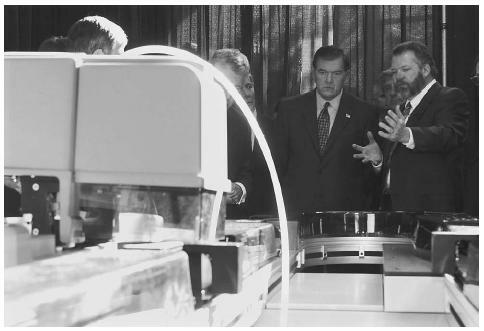 University of Nebraska researchers explain laboratory automation equipment available to analyze bioterrorism agents to the Secretary of the Department of Homeland Security, Tom Ridge, second from right. bioterrorists from acquiring the materials and expertize needed to produce biological weapons. Genetic engineering can produce a wide variety of bioweapons including bacteria or viruses that produce toxins. More conventional laboratory technologies can also produce bacteria that are resistant to antibiotics. Examples of the most likely to be used bioterrorist weapons include smallpox (caused by the Variola virus), anthrax (caused by Bacillus anthracis ), and plague (caused by Yersinia pestis ). The last recorded case of smallpox was in Somalia in 1977. As of 2002, only two facilities—one in the United States and one in Russia—are authorized to store the virus. In spite of international prohibitions, security experts suspect that smallpox viruses may be under development as biological weapons in other laboratories of many nations. As recently as 1992, Russia had the ability to launch missiles containing weapons-grade smallpox. A number of terrorist organizations including Al Qaeda have explored the use of biological weapons. Bioterrorism may ultimately prove to be more destructive than conventional warfare, because of the mobility of the weapons and their ability to spread infection through an entire population. An epidemic can spread a disease far from the point of origin of the illness. Preparing a strategy to defend against biological warfare is challenging. Traditional identification of microorganisms such as bacteria and viruses relies on assays that detect growth of the microbes. Newer technologies detect microbes based on sequences of genetic material. The genetic technologies can detect microbes in minutes. As of 2002, however, the genetic technologies are not available to any but the most sophisticated field investigative units. Researchers are also working to counter bioterrorist attacks using several other new technological strategies. For example, robots equipped with sensors or microchipmechanized insects (with computerized circuitry that can mimic biological processes such as neural networks) are being developed. Bees, beetles, and other insects outfitted with sensors are used to collect real-time information about the presence of toxins or similar threats. These new technologies could be used to examine a suspected biological weapon and spare exposing investigators to potential hazards. The robotics program of the Defense Advanced Research Project (DARPA) works to rapidly identify bio-responses to pathogens, and for designs to effectively and rapidly treat them. Research is also underway to find genetic similarities between the microbes that could be used by bioterrorists. A vaccine made of a protein that is common to several bacteria could potentially offer protection to the exposure any bacterium in the group, for example. Frist, W.H. When Every Moment Counts: What You Need to Know about Bioterrorism from the Senates only Doctor. Lanham, MD: Rowman & Littlefield, 2002. Henderson, D. A., and T. V. Inglesby. Bioterrorism: Guidelines for Medical and Public Health Management. Chicago: American Medical Association, 2002. Inglesby, Thomas V. "Bioterrorist Threats: What the Infectious Disease Community Should Know about Anthrax and Plague," in Emerging Infections 5 Washington, D.C.: American Society for Microbiology Press, 2001. Kaufmann, A.F., M.I. Meltzer, and G.P. Schmid. "The Economic Impact of a Bioterrorist Attack: Are Prevention and Postattack Intervention Program Justifiable?" Emerging Infectious Diseases no. 3 (1997): 83–94.